- Invite your friends to get a lot of AutoClicks! - Three new incredible powerups! - Take a look of your Sushi stats! Massimo Guareschi's Sushi Clickers is a how-fast-you-can-click-like game. It's all about tapping a giant shushi piece, increasing that way the virtual amount of calories consumed. Obviously, the faster and the longer you keep tapping, the higher the score. The game is all about tapping your screen as if you were possessed. When the cookies bar is full, some sushi pieces will rain from the top. Tap on them to increase your score. And keep tapping, above all, keep it up. Stats track how good you are. 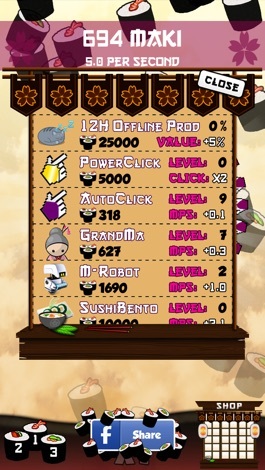 The cornerstone of Sushi Clickers lies on its online leaderboards. It would mean nothing be the fastest clicker in the world if you can't show off. You can submit your scores in Game Center and post it on your Facebook timeline. The game is set in rich cartoony graphics. Animations are neat and smooth. The only catch: the game gets boring after a while. Different game modes, achievements and extra bonuses would increase its playability. 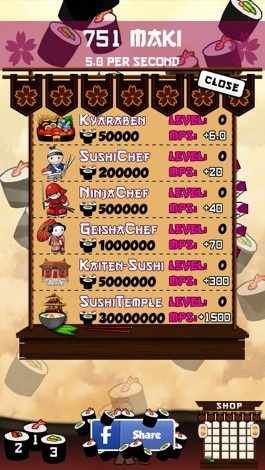 After the great success of Cookie Clickers, now on your iPhone, iPod and iPad has arrived.... SUSHI Clickers! 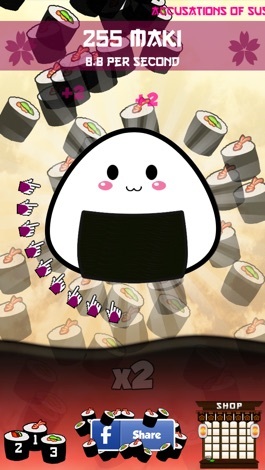 - Make as many maki as you can by clicking or tapping on a giant Onigiri as fast as you can. - As soon as you have enough maki take a trip to the shop and use your maki to buy upgrades to make maki even quicker! Suhi Clickers seemingly endless gameplay will allow you to play for an indefinite amount of time, or at least until you make such as an extraordinary amount of maki, your device will not be able to count them anymore. 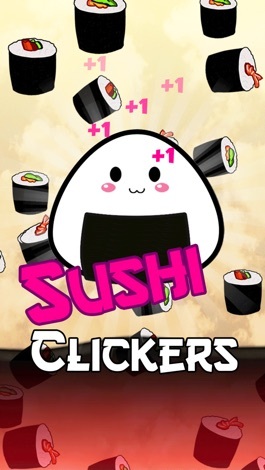 Become the Sushi Clickers Master.... be the first to make 1 BILLION maki! Don't waste time... play now, your friends have already started and you need to catch up…. Quick! Pizza Clickers challenges your tapping speed. Massimo Guareschi's Pizza Clickers is a how-fast-you-can-click-like game. It's all about tapping a giant pizza,and baking as many as you can. Obviously, the faster and the longer you keep tapping, the higher the score. The game is all about tapping your screen as if you were possessed. When the baking p…. Cookie Clickers challenges your tapping speed. Massimo Guareschi's Cookie Clickers is a how-fast-you-can-click-like game. It's all about tapping a giant cookie, increasing that way the virtual amount of calories consumed. Obviously, the faster and the longer you keep tapping, the higher the score. The game is all about tapping your screen as if you….